At Le Calabash, you embark on a French pastry adventure that will teach you to prepare bases and fillings, and learn the art of mousse, crème, tartes, and chocolate making, among many other useful techniques. All you need is a love for food and the desire to learn about cooking. The course provides hands-on opportunities to develop your culinary skills in a supportive learning environment, be on vacation in the most beautiful surroundings, and get the chance to make new friends. This is a charming 18th century coach inn, just three minutes from Le Calabash. It has been renovated to the most modern standards of comfort to provide one of the region's finest hotels. However, the owners have ensured it has retained its charm and character. Set in the small tranquil French village of Yzeures sur Creuse on the river Creuse in the Loire Valley, it overlooks the village square and church, which includes a 15th century shrine and the museum of ‘Mado Robin,’ France’s famous opera soprano as this is where she was born. The beamed bedrooms are all of a superior standard and decorated in period style, with en-suite bathrooms, air-conditioning, Wi-Fi, and flat screen TV. The bar and lounge offer a comfortable area to relax with a grand fireplace. You can also enjoy the calm of one of the two picturesque gardens with a glass of Loire wine. If you enjoy the outdoors, there is a swimming pool and a tennis court, and you are provided with canoes to explore either the Creuse or Gartempe Rivers, or discover the area by bicycle on the numerous cycle routes which are also provided. You are on the doorsteps of the Brenne, famous for its bird life, lakes and endless walks. This charming, four-star hotel is situated in the center of the pretty spa town of La Roche Posay. The hotel with its imposing Belle Epoque façade, surrounded by its rose garden and pivoineraie, thermal pool, and a large terrace with linden trees creates a unique and exceptional place in the village. Completely renovated in a chic country spirit with a hint of a “British touch”, it offers tasteful large hotel rooms and suites where each room has its own identity; wood, amaranth, coriander, and green countryside. The exterior has kept its Art Nouveau charm with its architectural frieze. The hotel offers a relaxing pool and bathing area where guests can soak up the French sunshine. Inside, there is an atmosphere of peace and authenticity with the solid wood floors and fireplace in the lobby. It is comfortable with character and charm. Les Loges du Parc four-star hotel is part of the prestigious Châteaux and Hôtels Collection (Alain Ducasse Group). Arrive after lunch, check in, and settle into your accommodation. There will be a welcome champagne cocktail and the opportunity to meet and get to know your fellow 'culinary adventurers', followed by Alison and Sidney’s ‘Taste of the Loire Valley’ dinner in the old stable at Le Calabash. After a traditional French breakfast, you will start your pastry adventure and master Choux pastry and Pâté à Sable Breton, which play an important role in pastries and dessert you will prepare throughout the week. You will also prepare bases and fillings for your tarts, eclairs, and profiteroles. For lunch, enjoy Alison and Sidney’s favorite French artisan cheeses, Charcuterie, and freshly baked bread. In the afternoon, you will use the pastry you prepared in the morning to create some classic, but impressive desserts with a contemporary twist! The class finishes at 5 p.m. and you will have leisure time until dinner, when you get to enjoy Sidney’s paella around the fire, weather permitting, or in the old barn. After a traditional French breakfast, it is time to learn the art of sorbet, ice cream, and frozen desserts; all of these will enable you to present restaurant-style desserts with ease. You will also prepare Alison’s ‘Iced Passion Josephine’, a passion fruit and mango dessert created for Napoleon Bonaparte’s love, Josephine. Today, you will enjoy a traditional French-style workers' lunch in a traditional bistro. The class finishes at 5 p.m. and you will have leisure time until dinner. Return to Le Calabash for a wine and chocolate pairing. Chocolate is the confectionery that best matches wine. Perhaps this is because the process of making chocolate is very similar to making wine. Both cocoa beans and wine are fermented with the very same type of yeast. No wonder there are so many wine and chocolate lovers! Dinner tonight is a demonstration of Sidney’s latest main course creation and one of the desserts prepared by the class. Have an early morning coffee in the garden before departing for Tours. Visit Tours' best bakery to choose your breakfast pastries which you will enjoy in a little market coffee shop. This morning, you will explore both the indoor Les Halles food market and the twice weekly outdoor market. Find to the south a Romanesque basilica, the Cloitre de St-Martin and the new Basilique de St-Martin. You are in the place which was once on the great pilgrimage route to Santiago de Compostela. St-Martin was a soldier who became bishop of Tours in the 4th century and helped spread Christianity throughout France. His remains, rediscovered in 1860, are now in the crypt of the new Basilique. The other old part, the cathedral quarter, on the other side of the main Rue Nationale, is dominated by the Cathédrale St-Gatien, a flamboyant Gothic building with 12th century decorated stonework covering the outside. Inside, the highlights are the 16th century tomb of Charles VIII and Anne de Bretagne’s two children, and the stained glass. For lunch, you will enjoy a traditional French meal at Le Calabash, prepared by Alison. A chocolate creation that is designed to impress. The class finishes at 5:30 p.m. and you will have leisure time until dinner. For lunch, you will have a classic bistro-styled menu. 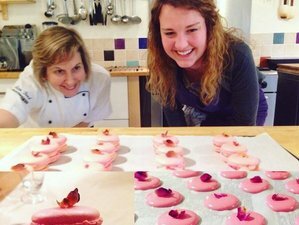 Alison will share with you her passion for creating and preparing one of the world’s most sought-after classics, the macaron, both classic and contemporary. For dinner, you will enjoy Sidney’s Zulu barbecue. You will have a traditional French breakfast from 8:30 to 9 a.m. Next, you will be learning and making garnishes that will enhance your desserts and ensure they are a feast for the eye. This will include Tuille work and sugar craft. For the lunch at 12:30 p.m., Sidney prepares one of his latest creations. The class finishes off in the afternoon to allow you to rest or take a last walk down to the river, and prepare for your last evening together. At 7:30 p.m., you will sip some champagne and be presented your certificate at Le Calabash. Later tonight you will dine with the Bond’s friend, Michelin-starred Jacky Dallais at the renowned Promenade Restaurant in Le Petit Pressigny. After the traditional French breakfast, it is time to leave. Departure takes place by 11 a.m. The classes are limited to eight, which allows Alison and Sidney to give personal attention to all guests. Alison and Sidney are award-winning chefs with many years of international experience. They take traditional French cooking and introduce exotic flavors and traditions from around the world to create an exciting culinary adventure. You will leave Le Calabash with a new-found confidence and enthusiasm, impatient to return to your own kitchen to experiment with your skills. This vacation will take place in the Loire Valley, in France. Le Calabash Petit Conservatoire de la Cuisine is located on the river Creuse in the heart of the Indre et Loire region, set in a small French hamlet on the edge of the local forest. The region is home to the finest goat’s cheese producers and wine-making has been deeply rooted here for centuries. This area is simply known as France’s ‘Bread Basket’. The Touraine is without question the home of the European Renaissance which brought with it a rich and diverse culinary history and depth. Set in a small hamlet surrounded by fields of sunflowers, rapeseed, wheat, and corn on the edge of the local forests, the school is also close to the river and quaint little villages which you can stroll or cycle through. Le Calabash shares the Loire Valley and its culinary and cultural heritage with you, using only the finest and freshest ingredients available seasonally. You have included in the price all daily meals, as per the itinerary. Thus, daily breakfasts are included, as are the welcome and farewell champagne cocktails on days one and six, and the lunches and dinners on days two, three, four, five, and six. The breakfasts are usually traditional French meals, except for the one on day four, when you will have an early morning coffee and pastries for breakfast instead. For lunch, you will have artisanal cheese and freshly baked bread on day two, a traditional French-style workers' lunch on day three, and a traditional French lunch on day four. On day five, you will enjoy for lunch a classic bistro styled menu, and one of Sidney's latest creations on day six. You will have a 'Taste of the Loire Valley’ welcome dinner on your first day, and a farewell dinner at the renowned, Michelin-starred Promenade Restaurant in le Petit Pressigny with a friend of the Bond’s. The other dinners will consist of paella on day two, Sidney’s latest main course creation and one of the desserts prepared by the class on day three, and Sidney’s Zulu barbecue on day five. On day five, there will also be a pairing of Loire Valley wines and French chocolates. Three glasses of selected wine will complement the meals. You will have a free afternoon on Monday, Tuesday, Wednesday, and Friday, when you can relax, walk along the river, cycle around the area, or book a treatment at the local spa. You can also visit the picturesque town Angles sur Anglin, or go to le Grand Pressigny. Le Calabash can provide you with a list of treatments in advance, so that you can choose the one you would like beforehand and they will book it for you for an additional cost. Please note that if cancelled, the treatment is non-refundable. You can also book your flight to arrive at Paris Charles de Gaulle Airport (CDG) or at Paris Orly Airport (ORY). Both airports are within an hour and a half by train to Chatellerault, Tours, and Poitiers stations where Le Calabash can pick you up upon request and transfer you to your ‘Culinary Adventure’. Transfer from Chatellerault will not be charged. Transfers form Poitiers can be arranged for the price of 45 EUR. Please book your flight to arrive at Poitiers-Biard Airport (PIS) in Poitiers, or at Tours Val de Loire Airport (TUF) in Tours. Le Calabash can pick you up from the train stations there upon request and transfer you to your ‘Culinary Adventure’. Please take the Eurostar, then the highly reliable TGV. There are two ways to get here. The TGV runs three trains per day directly from Terminal 2 at Charles de Gaulle Airport to Le Calabash which is an hour and a half away. You can take the Eurostar from the UK and change platforms at Lille for the TGV to Tours (note the station name is ‘Saint-Pierre des corps’) or Poitiers. Le Calabash is approximately an hour from either city. You can also take Eurostar to Paris, Gare du Nord, and then a bit of sightseeing perhaps before catching the TGV from Paris Montparnasse to Chatellerault, a short 20-minute drive from Le Calabash.